Directions for traveling to BCC - De website van bcc2016! 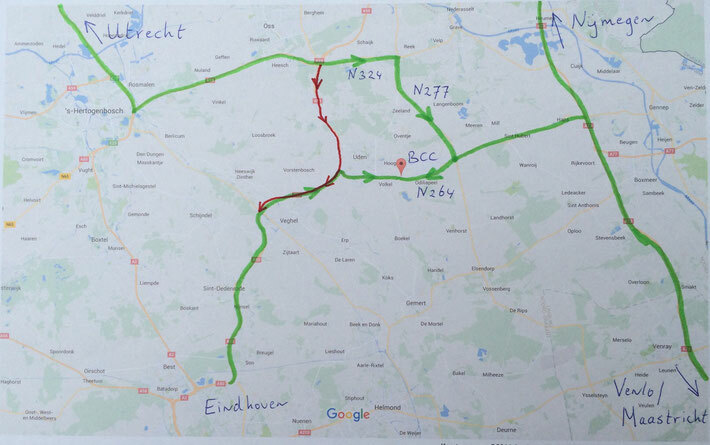 During the BCC the main high-way leading to Uden will be (partially) closed due to road works. Herewith instructions on how to reach BCC. Only people coming from direction Eindhoven will be confronted with this. Please take the A2 direction North (towards ‘s Hertogenbosch/Utrecht) and take the A59 towards Nijmegen followed by A50 towards Eindhoven. There you can take exit nr 13 to Uden/Volkel. People coming from Venlo/Maastricht: take the A73 towards Nijmegen and then exit nr. 5 to the N264 towards Haps/Uden. Only people going direction ‘s Hertogenbosch are affected. At the first roundabout, go left (instead of right). Follow the N264, then turn left on the N277 and turn left on the N324. You can enter the A59 towards ‘s Hertogenbosch here. See map 2 for reference. The A50 towards the South is closed from Friday 5 August 21:00 until 15 August (direction North is open!). This time, only people coming from direction ‘s Hertogenbosch will be affected. At the A59 towards Nijmegen, take at junction “Paalgraven” (near Oss) the N324 towards Schaijk/Grave. Then on to the N277 towards Venray and the N264 towards Uden. Only people going in the direction Eindhoven are affected. Take the A50 towards Nijmegen, at junction “Paalgraven” take the A59 towards ‘s Hertogenbosch and then on to the A2 direction Eindhoven. See map 1 for reference.